1. The full length of 1 meter, the maximum capacity of the chuck can be 11.6 inch tablet, the available range of the nut lock below is 5cm-8cm. 2 .Fit for iPad, Tablet, iPhone, Samsung, Andriod Phone. 3.Quality Guarantee:if you have any problem ,please feel free contact us .we will reply you within 24 hours. :When you use it for a heavy tablet larger than 8 inches, please loop the gooseneck into a circle shape or bend it into "S" shape which would provide more stability. Please make sure that the screen size of your phone/ tablet is larger than 4 inches before you place the order. 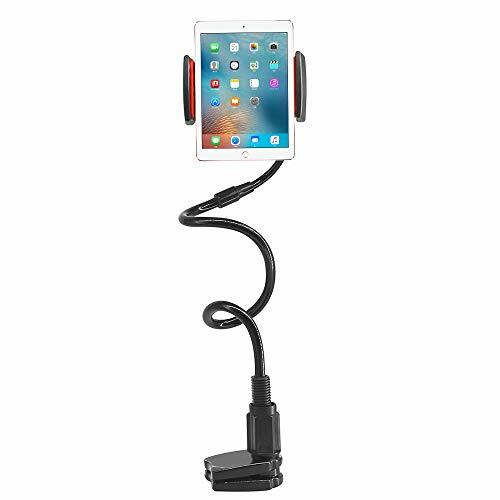 : This stands holders made by slip-resistant, sturdy, thickened bottom clamp and a well-fixed gooseneck universal lever to ensure your phone and tablet can firmly balance or flexibly change direction. : Suitable for Apple iPhone iPad or other Android Devices from 5 to 11.6 inches. Whether you are on the office , kitchen, bed, couch or elsewhere.Tthis lazy bracket ables to free your hands. has two different hardness materials. Its Bottom is the hardest materials, to maximize the stability of the phone and tablet. The other section is relatively soft than bottom, so it can flexibly adjust the visual angle base individuals need. Different perspectives have different experiences. : The height of the fixed section can be adjusted from 0 to3.34 inch(8.5cm). It is compatible with most tables and desks of different thicknesses. :Kindly note that this item is suitable for viewing or reading only. It will shake quite a bit and make you uncomfortable if you need to touch or tap the device frequently. However it is inevitable due to some law of physics. If you have any questions about this product by Pengsha Qi, contact us by completing and submitting the form below. If you are looking for a specif part number, please include it with your message.